Existing-home sales decreased 3.6 percent to a seasonally adjusted annual rate (SAAR) of 5.57 million in December — dipping from a downwardly revised 5.78 in November, the National Association of Realtors (NAR) reported today. This month’s sales pace is 1.1 percent above December 2016 and is the strongest sales pace in 11 years. The median existing-home price for all housing types in rose 5.8 percent to $246,800, making December the 70th month in a row to see year-over-year gains. Total housing inventory fell 11.4 percentage points month-over-month to 1.48 million homes for sale, while year-over-year inventory dropped 10.3 percentage points. It was the 31st consecutive month of year-over-year declines. Unsold inventory is at a 3.2-month supply — the lowest level since NAR began tracking in 1999. 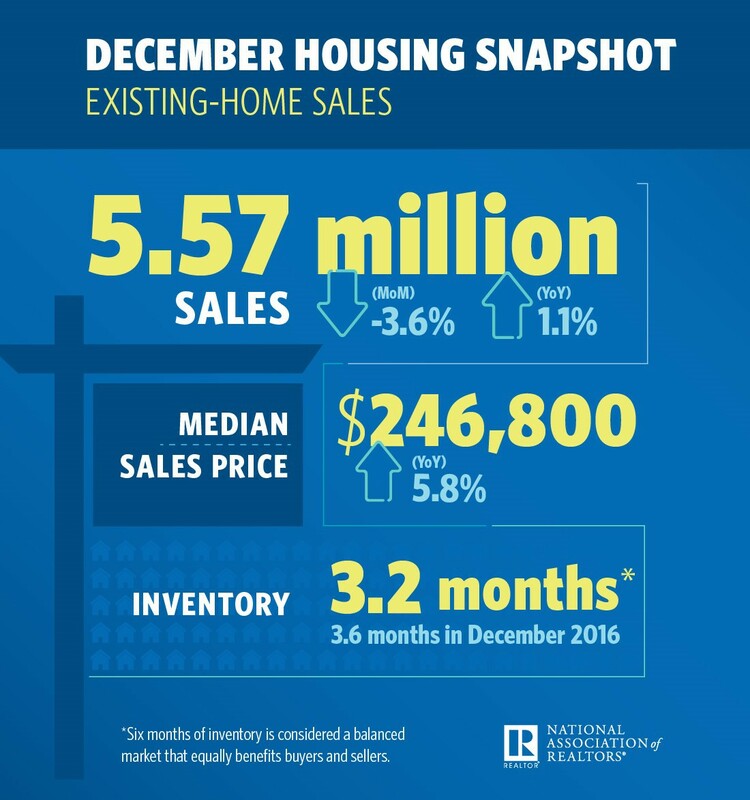 NAR chief economist Lawrence Yun says a healthy economy and robust job growth drove buyer demand in 2017, but high home prices and strapped inventory kept home sales from reaching its highest potential. 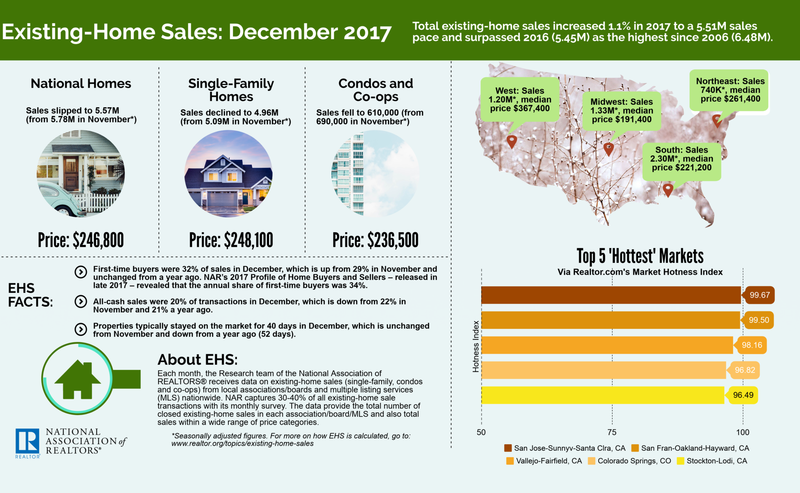 “Existing sales concluded the year on a softer note, but they were guided higher these last 12 months by a multi-year streak of exceptional job growth, which ignited buyer demand,” said Yun in a press release. Keller Williams chief economist Ruben Gonzalez echoed Yun’s sentiments and said 2018 is shaping up to be a strong year for home sales, despite continued inventory issues. “Overall, we look forward to 2018 being another strong year for home sales, likely similar in magnitude to the previous two years,” he finished. Distressed sales, which include foreclosures and short sales, were at 5 percent — a 1 percentage point increase from last month and down 2 percentage points from a year ago. Four percent of December sales were foreclosures, and 1 percent were short sales. Single-family home sales were at a SAAR of 4.96 million — a 2.6 percentage point month-over-month decrease, but 1.0 percent above a year ago. The sales price for single-family homes increased by 5.8 percentage points to $248,100. Existing condominium and co-op sales decreased 11.6 percentage points to a SAAR of 610,000 units, 1.7 percentage points above a year ago. The median existing condo price in December was $236,500 — up 6.4 percentage points from 2016. “December existing-home sales in the Northeast fell 7.5 percent to an annual rate of 740,000, and are now 2.6 percent below a year ago. The median price in the Northeast was $261,400, which is 3.0 percent above December 2016. NAR’s existing-home sales are based on transaction closings from MLSs and include single-family homes, townhomes, condominiums and co-ops. Seasonally adjusted annual rates are used in reporting monthly data to help accommodate for seasonal variation; the annual rate for any given month represents what the total number of actual sales for a year would be if the pace for that month were maintained for a whole year. How high will homebuyers go?